Reviewing audio devices require extensively trained ears and lots of experience. Even for audiophiles, it may prove challenging at times to obtain an accurate evaluation of a product without a thoroughly familiar product to use as a simultaneous reference. While I am not going to even try to claim that I am the only trustworthy or best reviewer for sound, it is fact that most computer review sites have editors who are insufficiently trained in reviewing audio equipment. Give them practically anything and all you will read about goes along the line of "good bass, nice midrange, awesome treble, really clear sound, 10/10". While there are many knowledgeable audio reviewers at various respected online media outlets, they are by far the minority. As I have mentioned in my past audio reviews, there are really no true objective measurements for speaker sound quality. As the reviewer, however, I will put it through a series of subjective tests to try to come up with the most objective rating possible -- yes, it is a paradox, haha. On the wired, analog side, tests were conducted primarily on my computer via an optical audio cable directly connected into my Gigabyte motherboard. For Bluetooth wireless tests, I mainly used a Sony Xperia X. After over 200 hours of break-in time -- well above typically required period -- we put the Creative Stage to the tests. The equalizer was set to the default setting. All tracks on our devices are uncompressed CDs, FLAC, or high bitrate LAME encoded MP3s. As usual, I start with exploring the lowest range of frequencies. I was a bit surprised to see such a thin subwoofer produce a decent amount of bass. One problem with soundbars is the fact they lack the physical space for any lower frequency drivers, so the solution means pairing it with a subwoofer. As for the one with the Creative Stage, this subwoofer is actually capable of moving some serious air for a decent amount of low-end. However, while the amount is not bad, it features some less than ideal characteristics. Its sound can be a bit muddy and boomy, lacking in definition or direction. It lacks the rounded nature of bass I would have liked to see. This is a bit of a disappointment, especially since I think it is sufficient in quantity but lacking in quality. As for the middle of the frequencies, the overall feel is one of a recessed nature. At the lower midrange, there are some chunks of frequency that seemingly are even more reduced than I would have expected. Instruments like guitars or piano can be heard with a natural wooden resonance, but you can start hearing the dryness creep in. Vocals sound slightly dry as their singing is reproduced with dryness and some muffle. Sibilance can be heard in vocals more than I would have liked. Moving to the top of the frequency range, the treble is decent despite the smaller drivers. This range sounds boosted and it is a bright and sharp sound. However, we still have the same dryness we heard from the midrange, and the very top starts getting a bit more uncomfortable with this. Instruments like violins and flutes cut clearly through the music, but they are a bit too shrill. When it came to soundstaging and imaging, I have to say the Creative Stage is not bad. A soundbar is physically limited because, unlike two speakers, the two tweeters are confined to a physical distance apart. As such, we have a physically limited width and a respective width for audio. There is some decent depth in the sound, which is pleasing to hear. The overall image retains a natural one, though once again, it is affected by the narrower sound. I would not really say they put the Stage in soundstage, but this Creative soundbar is not bad in this department. In terms of layering and frequency separation, the Creative Stage is capable in handling separation while keeping detail. However, more complicated music sounds a bit too merged together, and you can start losing different voices or instruments. Transitions between frequencies feature some notable chunks missing, especially from bass to midrange. In addition, I think there can be a bit of work done in the cleanness of the output, as all three ranges show difficulty in reproducing more heavily layered music with clarity. There is also some muffle found in various regions. Overall, the combination shows off the V-shaped sound character that makes for a fun sound. It also delivers on the 160W peak power, as the Creative Stage can get quite loud for its size. On a day to day use, there was an annoying flaw where the soundbar would just stop playing if the input is below the rather high threshold. This happened over different inputs and devices. This momentary standby-like feature is probably a power saving one and is not unique to this set. However, Creative seemingly took too aggressive of a formula for this, as it often activated in quieter portions of songs or during videos. Increasing the input volume did somewhat alleviate this problem, but it also meant I had to adjust the volume on Stage directly instead of on my computer. Either way, I think this should be fixed for future Creative speakers. A lower threshold and a longer idle time before standby will do wonders. All in all, the Creative Stage has the expected makings of a budget soundbar. It is great to see the amount of bass and decent trebles for a fun V-shaped sound signature. 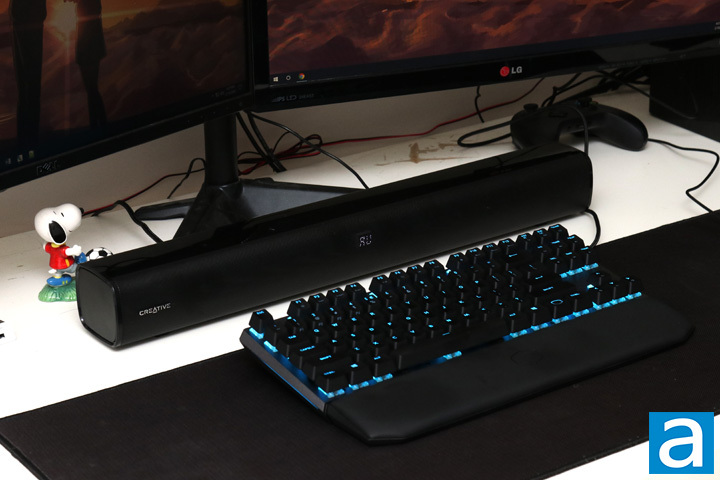 The soundbar delivers a better than expected soundstage in depth, even if lacking in width. It also is capable of getting quite loud before any notable distortion. However, flaws can also be seen when we take a look at its layering capabilities, as it starts to lose detail and clarity in more complicated pieces. As such, the Creative Stage may not win any awards, but it is not bad for its price range.